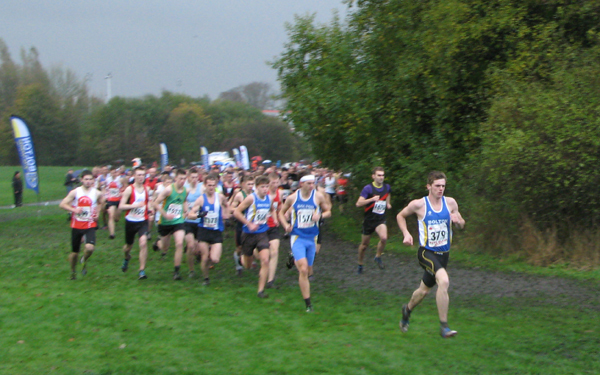 BUH&AC hosted the third round of Red Rose Cross Country series which yielded some decisive results for the Leverhulme Park-based club. The day got off to a promisingly bright and dry start, with the evergreen running legend Ron Hill trotting past in the morning’s Park Run (won convincingly by a recovering Shay Walker) as the course was being set up. The warm sunshine was at odds with the ground frost and large dark clouds loomed, offering convincing evidence that the Met Office was not going to be wrong. Their forecast map predicted it was to be a ‘blue’ day, and it was for many a reason! As the final touches were being laid to the course and the smell of bacon butties wafted across the team tent area, Stewart Brierley tried to add an extra obstacle to both the starting straight and finishing furlong. Although his best efforts can be tagged “Failed Delivery”, Darren Grimshaw’s proper all-terrain vehicle rescued the now not-so-white-but-definitely-off-road white van with 20 minutes to spare. For the senior men, Tom Carson, as ever, assumed his position at the fore of the pack of senior men before the first turn, having negotiated 150m of flat, skiddy, short grass (mud/puddles/bathing pools)*. The customary lead wasn’t extended beyond 20m for the whole race due to not fully recovering from an ankle sprain three weeks ago and he was clearly uncomfortable on the downhill sections. Towards the end of the third and final lap, he tactically allowed Rossendale’s Joseph Johnston to catch him before increasing the stride length in the home straight. Grimacing through the pain barrier, the sprint finish was enough to hold on to his 100% win record by a single second (36:07), with Horwich’s Chris Farrell (36:15) only losing touch in the final 400m for bronze. The result means Carson cannot be caught in the series standings and will retain his RRXC crown for a third successive year. Jonny Kay’s 37:44 was somewhat isolated in ninth after superbly running his own race and not panicking early. Although classed as third u20 on the day, it was effectively RRXC gold due to the ineligibility of Sale’s Luke Betts and ECH&TAC’s Joe Steward, thus confirming his unassailable lead in the category rankings for the series. Fraser Jardine, third counter for Bolton, enjoyed an opening dash duel with Carson and Kay, but settled into a good rhythm after the first lap to claim 12th (38:35). The ever-improving Andrew Cafferky (39th) pulled away from the 44th-46th trio of Mark Swannell and two Simons (Walker and Dally), relishing the longer distance of the Bolton course. Ian Selby (69th) was exactly a minute in front of a great club ding-dong between Andrew Doyle and Pete Kearney – the former whiffing the place by a nose despite the same time (45:45). Among the other squad members, a steely Nick Howarth executed well as wingman Ben Troughton slowed through muscle niggle; Dave Hanson ran smoothly throughout but didn’t have the legs to pip the veteran Graham Shaw; John Grimshaw made his cross country debut and Shaun Lomax staked his claim for special highlight of the day – his 53:17 smashed last year’s time by nearly 5 minutes and illustrates his 2013 progress. On what turned out to be a ‘proper’ four-seasons-in-one-day, a record turnout of 205 ‘enjoyed’ the interesting weather and conditions. Strong performances by the Rossendale squad meant they claimed the team prize with 77 points to BUH&AC’s 130. However, it is Leigh’s 325 (103, 230, 222) that is most likely to threaten Bolton’s 208 (95, 113, 128) as they seek to retain the Champions trophy. In the senior women’s race, Dionne Allen (21:26) of Leigh Harriers was the comfortable winner from Darwen Dashers’ Joanne Nelson (22:07). For Bolton, Sarah Saxon (25:39 – 22nd) was first counter after Shannon Johnson was forced to retire through injury, whilst the squad will be hoping Michelle Philbin (27:58) makes more regular appearances in the 2014 season after another bright performance. Also braving the hailstones were Cherry Collison (28:40), Julie Lomax (29:31 – improving 53s on the 2012 result) and Jane Lim (33:11). Under-17s – Yet again, good individual outings were marred by the lack of team strength to do them justice. Fiona Gande (26:19) showed strength to work through the field on the second lap and remains 7th in the series’ standings. For the boys, an isolated Declan Toomey (20:33) claimed a season’s best 4th position, whilst Mathew Walker’s (21:40) strong finish grew the slim gap to eleventh at 200m to an eventual 8 seconds. Under-15s – Home territorial advantage or collective improving performances? Probably a bit of the former but also very much the latter: the boys stormed to a team win with 17 points to Pendle’s 30, having four in the top ten. Liam Doherty (17:20) took Bronze – his highest finish this year to move to 5th in the standings, as Joe Gande (17:28 – 5th), Luke Entwistle (18:04) and Jordan Kirkwood (18:09) ably contributed. The girls’ 31 points saw them to the podium too, with Rachel Bailey (19:47 – 8th [series rank 5th] leading home Katie Oakley (19:53) and Millie Hill (20:38). The age-group’s series standings make tense reading with BUH&AC having a good chance in both (currently boys 2nd and girls 3rd). Under-13s – Another fine display from the close-knit group of girls in this age-group was exemplified by Molly Philbin and Ellie-Jo Ramsden battling it out right to the line. Both recorded 15:11 for 11th and 13th place respectively, whilst Lydia Mathews (15:16 – 14th) was not far behind the action. Leah Rushworth (16:37), Sophie Green (16:56) and Ellie Forrest (18:26) also featured for the team that claimed third position. Unfortunately, Nathan Bancroft (14:35 – 26th) and Evan Merkin (15:37) were short of a third counter for the boys’ team. Under-11s – Louis Greenhalgh (8:10 – 24th) and Harrison Wild (8:29) competed in the first race of the day, with both discovering where the mud lurked! Amy Rossington (8:26- 15th) was immediately followed home by Ciara Gettinby (8:30), whilst Grace Tonge’s 9:53 proved crucial to allow the team to register 6th position. Despite Bolton’s home turf, it was Bury AC that turned up with perhaps the largest ever junior squad, and is something new u11 coordinator coach Ian Wallis hopes to emulate. Thanks to all those volunteers that braved the weather to ensure another safe and slick event, especially the marshals (hands warm yet?!) but also First Aid, timekeepers, course putter-uppers and course taker-downers. For all the planning, it wouldn’t be possible without people on the day. A special mention to the marshalling Hood family – Karen recorded a Personal Best (44:39) to finish 11th (117th overall) in the Windmill 10K in Lytham on Sunday, whilst husband Andrew clocked 48:09. Chris Worthington (50:29) was also among the 668 field. Full results of the races (also in printable PDF) are available. The series positions (also in printable PDF) are also available now that three of the four matches have taken place. For photos, go to BUH&AC Gallery, or RunningPix [part1] (u11s, u13s and u15s) and RunningPix [part2] (u15s, u17s and seniors).